Acute heart failure (AHF) is one of the most common diagnoses for elderly patients in the emergency department (ED), with an admission rate above 80% and 1-month mortality around 10%. The European guidelines for the management of AHF are based on moderate levels of evidence, due to the lack of randomized controlled trials and the scarce evidence of any clinical added value of a specific treatment to improve outcomes. Recent reports suggest that the very early administration of full recommended therapy may decrease mortality. However, several studies have highlighted that elderly patients often received suboptimal treatment. Our hypothesis is that an early care bundle that comprises early and comprehensive management of symptoms, along with prompt detection and treatment of precipitating factors should improve AHF outcome in elderly patients. ELISABETH is a stepped-wedge, cluster randomized controlled, clinical trial in 15 emergency departments in France recruiting all patients aged 75 years and older with a diagnosis of AHF. 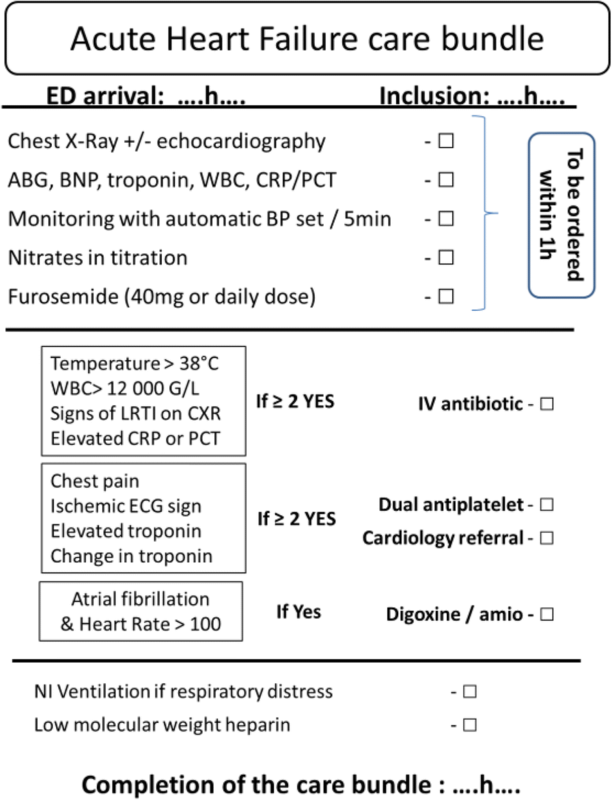 The tested intervention is a care bundle with a checklist that mandates detection and early treatment of AHF precipitating factors, early and intensive treatment of congestion with intravenously administered nitrate boluses, and application of other recommended treatment (low-dose diuretics, non-invasive ventilation when indicated, and preventive low-molecular-weight heparin). Each center is randomized to the order in which they will switch from a “control period” to an “intervention period.” All centers begin the trials with the control period for 2 weeks, then after each 2-week step a new center will enter the intervention period. At the end of the trial, all clusters will receive the intervention regimen. The primary outcome is the number of days alive and out of the hospital at 30 days. If our hypothesis is confirmed, this trial will strengthen the level of evidence of AHF guidelines and stress the importance of the associated early and comprehensive treatment of precipitating factors. This trial could be the first to report a reduction in short-term morbidity and mortality in elderly AHF patients. ClinicalTrials.gov, ID: NCT03683212. Prospectively registered on 25 September 2018. Acute heart failure (AHF) is a syndrome defined as new-onset or worsening of symptoms and signs of HF, often requiring rapid escalation of therapy and hospital admission. The clinical presentation of AHF typically includes symptoms or signs related to congestion and volume overload rather than to hypoperfusion . Acute heart failure represents 5% of all emergency hospitalizations, and is the most common primary diagnos in patients aged ≥75 years visiting the emergency department (ED) [2, 3]. The EDs are the main entry to the hospital for AHF, with 64% of these admissions being subsequent to an ED visit . This syndrome is reportedly associated with poor outcomes, with a 80% rate of hospital admission, a median length of hospital stay of 10 days and a mortality around 10% at 30 days, and a readmission rate of 25–30% at 30 days [5–7]. Despite a high rate of morbidity and mortality, the management of AHF has not changed for several decades and most clinical studies failed to demonstrate a positive impact of new drugs on patients’ prognosis [8, 9]. European guidelines include the use of diuretics, nitrates, oxygen and non-invasive ventilation (NIV) when indicated along with the treatment of any potential AHF triggers (precipitating factors). However, these guidelines are based on moderate levels of evidence (IB and IIaB), and high-quality randomized controlled trial (RCT) data are lacking [10–12]. In 1998 and 2000, the two cornerstone trials of Cotter et al. provided evidence of the benefits associated with early vasodilator therapy with nitrates, although on a very small sample of patients (less than 200 in total) [13, 14]. Since then, every prospective trial on AHF management failed to report a clinically significant improvement of outcomes. Equipoise remains on many questions regarding the recommended therapeutics: the optimum dose and route of administration of diuretics are not clear, the use of nitrates is also debated, and the benefit of NIV is unclear [15–17]. Despite these controversies, recommendations and guidelines are published by international societies (European Society of Cardiology (ESC), American Heart Association (AHA), etc.) and constitute the basis of our understanding and standard of care [10, 11]. However, a large proportion of elderly patients in AHF do not receive adequate care, including low rates (30–50%) of nitrate therapy [7, 18]. We recently conducted a preliminary analysis in eight French EDs participating in the present ELISABETH trial. For a 7-day period, we evaluated all consecutive patients aged 75 years and older with a diagnosis of AHF in the ED. Among the 73 consecutive AHF patients, 23 patients (32%) had not been investigated for the findings of precipitating factors of AHF (namely infection, acute coronary syndrome (ACS) or atrial fibrillation). In total, only 18 elderly ED patients (23%) were managed according to the existing guidelines . The hypothesis of our trial is that an early and comprehensive care bundle, that associates prompt treatment of congestion with intravenously administered (IV) nitrate boluses and early recognition and treatment of potential precipitating factors, will improve short-term morbidity and mortality. The ELISABETH trial (NCT03683212) is a stepped-wedge clinical trial in France . The primary objective of this study is to assess the change in the early (1-month) morbidity and mortality of AHF in elderly patients with the implementation of an early and comprehensive care bundle in the ED. In this stepped-wedge clinical trial, patients will be recruited in 15 EDs in France, academic and non-academic, rural and urban (Table 1). All clusters will begin the trial with the “control period” where included AHF patients will be routinely managed by the emergency physicians. After a first step of 2 weeks, every 2 weeks, one center will randomly be assigned to switch to the “intervention period” where the ELISABETH care bundle will be implemented. After 32 weeks, all centers will be in the “intervention period” for the four remaining weeks of the trial (Table 2). A written informed consent signed by the patient will be necessary prior to inclusion. If the patient is unable to consent, then the physician will seek consent from a trustworthy person, family member or close relative. If none are available, the physician will be able to proceed to an emergency inclusion and then the written informed consent will be signed by the patient (if need be by a trustworthy person, family member or close relative) as soon as possible (article L1122-1-2 of the French Public Health Code). The main objective of the present trial is to compare the efficacy of an early and comprehensive management strategy of AHF in elderly patients to the usual care on morbi-mortality at 30 days. Our primary endpoint is the number of days alive and out of hospital at 30 days after the index ED visit. This endpoint is considered as relevant by the group of experts of the ESC . In their consensus paper, the experts stated that although mortality should be captured, repeated hospitalizations should also be recorded. Especially in elderly patients, where the rate of readmission to the ED and rehospitalization is elevated: up to 40% of heart failure admissions to the hospital are actually repeated admission for recurrence of symptoms within 30 days of a previous AHF event [3, 6]. We chose the timeframe of 30 days because a shorter timeframe would not catch recurrence and morbidity, and a longer timeframe would catch events that are more likely linked to chronic morbidity of the patients than to the AHF syndrome [22, 28, 29]. The primary endpoint (days alive and out of hospital at day 30) will be measured at the end of the 30-day follow-up period, either by hospital visit or phone interview, and medical chart review. Vital status, date of death and date of discharge will be collected. A death during the follow-up period will correspond to 0. An ED visit will correspond to “1 day” at the hospital. For example, a patient not admitted (at day 0), with no return visit to the hospital, and alive at day 30 will have 30 days alive and out of hospital. A patient who is admitted (at day 0) and stays 8 days in the hospital before being discharged and has no readmission and no return visit to the ED would have “22 days alive and out of hospital at 30 days.” A patient who is admitted and dies at 13 days, either at home or in hospital will score 0. A patient who is admitted for 10 days, discharged home for 5 days then admitted at day 16 for 15 days will have 5 days alive and out of hospital (namely days 11, 12, 13, 14 and 15). Creatinine will be measured at day 0 in the ED, and at discharge day or day 30, whichever comes first. This is an intervention study, where the intervention comprises the application of recommendations and guidelines for the management of AHF, ACS and infection. The guidelines and standard of care will be recalled to the emergency physicians at the beginning of the trial in each center when the control period will start. All treatments will be initiated in the ED, and their continuation or discontinuation will be evaluated by the treating physician during the subsequent hospital stay. No interim analysis is planned. Analysis will be performed at the end of the study after data review and freezing of the data base. Analyses will be performed using SAS® software (version 9.3 or updated version). Principal analysis will be realized according to the intention-to-treat (ITT) principle. Baseline patient characteristics will be considered at both with the cluster (center) and patient level. For the center level, characteristics at the beginning of the study will be described (there are no expected changes between the two periods for cluster characteristics). Baseline characteristics of patients will be described globally and according to the period. Continuous variables will be summarized using descriptive statistics, i.e., number of subjects, mean, standard deviation (SD), median, inter quartile range, minimum and maximum. Qualitative variables will be summarized by frequency and percentage. The number of days alive and out of hospital will be calculated based on date of admission, vital status, date of death and date of discharge will be collected. This primary endpoint will be analyzed using a linear-regression mixed model with a random effect for each cluster, considered fixed effects will be: strategy and, for the stepped-wedge design, time representing each step. In case of non-normal distribution of the interest variable, a transformation could be realized. All-cause mortality at 30 days, cardiovascular mortality at 30 days and hospital readmission at 30 days will be compared between groups by using Pearson’s chi-square test or Fisher’s exact test. If possible, a generalized linear-regression mixed model with Poisson distribution will be performed. If the number of events is sufficient, a generalized linear-regression mixed model using the logit link will be performed. The length of stay in hospital in days will be compared between the two periods by using Student’s t test or the Wilcoxon rank-sum test as needed. If possible, a linear-regression mixed model will be performed. A random effect for each cluster will be considered and considered fixed effects will be: strategy and, for the stepped-wedge design, time representing each step. In case of non-normal distribution of the interest variable, a transformation could be realized. The percentage of patients with a change of more than twofold in creatinine between inclusion and 30 days will be compared between groups by using Pearson’s chi-square test or Fisher’s exact test. If possible, a generalized linear-regression mixed model with Poisson distribution will be performed. If the number of events is sufficient, a generalized linear-regression mixed model using the logit link will be performed. A second analysis will be performed on the per-protocol population. All tests will be performed with an alpha set at 5%. From our previous cohort, the mean number of days alive and out of hospital at 30 days was 14 ± 9. To be clinically relevant, we estimate that the new approach should increase this endpoint of 3 days at least (a relative increase of 20%). With a power of 80% and alpha = 5%, 283 patients are needed to be included. Considering the stepped-wedge design and after specification of the following elements: 15 clusters, intra-cluster correlation (ICC) = 0.0001, the design effect is estimated at 1.609, increasing to 454 subjects who need to be included. Taking into account 10% of non-evaluable patients, it is necessary to include 500 patients – two per cluster for each 2-week period (Additional file 1). Despite a small improvement in the outcomes of elderly patients admitted for AHF within the past decades, its morbidity and mortality remains severe with a 10% rate of 30-day mortality, and 25–30% of early readmission rate [6, 7, 18, 31]. In the majority of cases, treatment can be initiated in the ED. However, many studies have shown that a majority of these patients are still not receiving recommended therapies in the ED – either for AHF per se, or for precipitating factors of AHF, especially ACS or infection [7, 16, 18]. In this context, there is an urgent need for a multidisciplinary management program for patients with AHF in the ED and following ED care to ensure better results and adherence . The great outcome improvements provided by early treatment in the ED have long been established for other pathologies (e.g., sepsis, myocardial infarction). Unfortunately, AHF has not been considered with this regard until recently. Some reports suggest the importance of time to introduce therapy in AHF. Data derived from the ADHERE registry indicate that early treatment (< 6 h) in EDs would create a positive impact by decreasing in-hospital mortality and morbidity rates (unadjusted OR for in-hospital mortality 0.77, adjusted OR 0.87 (95%CI [0.76–0.96]) . Very recently, in their large prospective observational study, Matsue et al. reported a significant decreased mortality in AHF following the initiation of decongestion therapy within 1 h in the ED (OR for in-hospital mortality of 0.39 (95%CI [0.20–0.76]) . As expressed by Januzzi and Felker in a recent editorial, “the failure of novel therapies for AHF requires us to make better use of what we already have. A systematic approach would allow an optimal management of acute HF, and in turn could finally improve outcomes” . If our hypothesis is confirmed, our trial of this early intensive care bundle will be the first RCT to show a significant reduction in short-term morbidity and mortality in elderly AHF patients, similar to what was achieved for sepsis (with a 15% absolute reduction of in-hospital mortality) [34, 35]. Lastly, it can be stressed that the observed high rate of deviation from the guidelines may be caused in part by their low level of evidence. A positive outcome of the introduction of a care bundle based on these recommendations would increase physician adherence and patient outcomes. This is adapted from version v4–0.2018_11_28 of the ELISABETH protocol (Additional file 2). Inclusion will start on 10 December 2018 and end on 19 August 2019. YF drafted the article. YF, JG, SS, VL, TS and AM participated in the elaboration of the study design and writing of the protocol. MC and TS are responsible for the statistical analysis. JG and AM made substantial contributions to the protocol and this article. All authors take responsibility for this paper as a whole. All authors read and approved the final manuscript. Informed consent will be obtained from all study participants whenever possible. If the patient is unable to consent, informed consent from a relative will be obtained. If there is no relative, an emergency consent could be obtained. In all cases, the patient’s consent will be obtained as soon as their condition allows it. An Institutional Review Board authorized the study (Comité de Protection des Personnes SOOM 2, ID-RCB: 2018-AO1139–46, 6 September 2018) for all participating centers, as this trial will be conducted in France only.